Check out this recent installation of FORm_office Adjustable Height for a Private Investment Firm. Design by Gary Lee Partners and photography by Jonathan Allen. Architect Clive Wilkinson, a recognized leader in workplace design, is responsible for some of the most creative office spaces in the world. With a thoroughly modern approach to the way we work, his firm has created spaces for Google, Twentieth Century Fox Digital and countless other business leaders using everything from hanging pod chairs to bean bags and breakfast bars. The need for a separate space at home is different to commercial offices, which Wilkinson says are veering towards open-plan design. “The driving reason to go to work is to collaborate and therefore most of the space should be configured to support that,” he says. In commercial office spaces, he says there is now a stronger push towards keeping workers moving and less sedentary. “It’s a major concern in planning work space,” Wilkinson says. “People need to move around during the day to stay alert and healthy. We like to emphasize staircases over elevators and to locate amenities to drive people to move around.” But whether your office is a bus ride away or just at the end of the hallway, Wilkinson is a strong believer in well-designed workspaces. Content originally published in The Daily Telegraph, August 22, 2015. While the tech field has undoubtedly changed the way in which we interact with our world, there is one field that has undergone a complete transformation in the last two years: the pre-built office. Eschewing the traditional blank-canvas method of leasing retail space, commercial landlords are turning to finished office spaces specifically for start-ups that would rather lease an office where set-up isn’t needed. The presence of plug ‘n’ play spaces in commercial architecture is already widespread. The challenge of such spaces is that they must appeal to everyone. To satisfy whichever company may eventually settle into the space—particularly those in the “TAMI” industries: technology, advertising, media, and information services—it must incorporate ideal market positioning, technology, workplace organization, and aesthetic. With so many start-up companies embracing less traditional workspaces, creating plug ‘n’ play offices can be costly. “They all want an open collaborative workspace with a loft aesthetic,” explained Montroy. While ductwork and mechanical systems could previously be hidden under a dropped ceiling, today’s open-ceiling buildings require that architects work alongside engineers to ensure that the exposed mechanical layout meshes harmoniously with interior elements. According to CBRE’s Laura Bruno, real estate property manager of 180 Madison Avenue, this extra cost could be good for business. “The trend of the quality pre-built is here to stay,” she said, adding that it’s become something that tenants are learning to expect. In her experience, the market is currently split 50-50 between companies looking for a blank canvas versus a finished office space, suggesting the future may lead to a more holistic design approach. Content originally published in Interiors & Sources, June 1, 2015. Currently, many office temperatures are set at 70 degrees Fahrenheit, a temperature that’s comfortable for most men. However, many women would be comfortable at 75 degrees Fahrenheit. The solution to this discrepancy may be providing people with the opportunity to control the temperature at their own workspace or to relocate easily to spaces in their workplace with different temperatures. Not only are Kingma and Lichtenbelt urging an end to the Great Arctic Office Conspiracy for comfort’s sake, they also conclude that buildings with a “reduce[d] gender-discriminating bias in thermal comfort” have the added benefit of helping combat global warming. Content based on the study, “Energy Consumption in Buildings and Female Thermal Demand,” by Boris Kingma and Wouter Lichtenbelt published in the Nature Climate Change journal. Inspired by the dystopian world depicted in the pages of the Divergent literary series, Citi’s Managing Director and Chief Operating Officer of HR Susan Catalano, modeled her group’s offices after the fictional books. 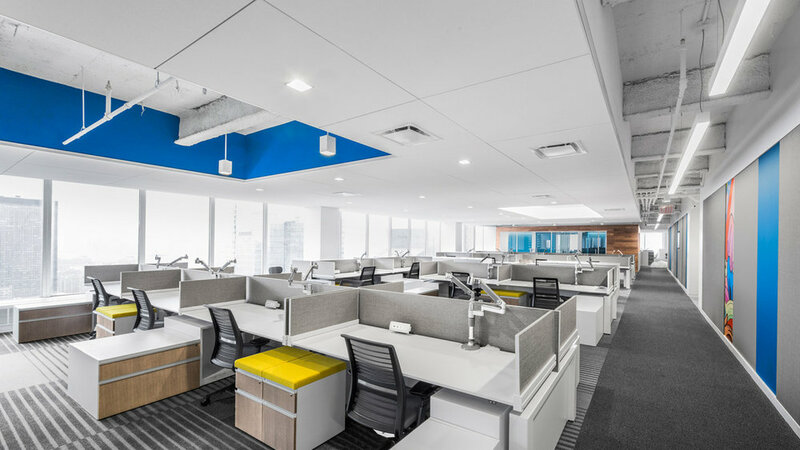 In order to foster collaboration and autonomy in Citi HR’s new workplace, the floorplan was segmented into “neighborhoods - a compensation neighborhood, a learning and development neighborhood, etc. — to help individuals feel they ‘owned’ their space, even though no one has a designated workspace and no one has a private office,” Catalano explains. This pilot concept – of assigning employees areas instead of actual seats – encouraged a sense of belonging, while also enabling a healthy sense of identity. The concept also addressed two practical problems facing Citi: First, people had been scattered in different offices throughout the metropolitan area, creating a fractured feeling. Second, an internal study showed that some offices - like most workplaces - were underutilized because of travel, vacation, illness and flexible working arrangements. 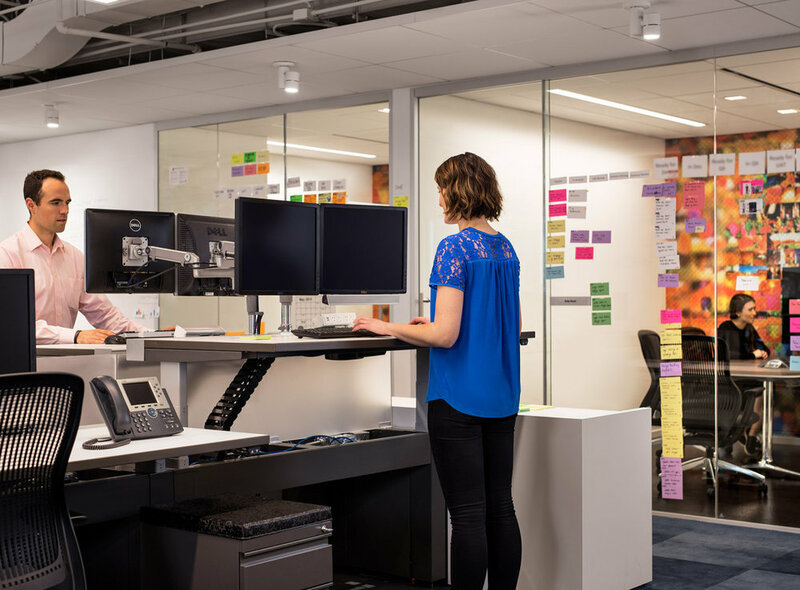 In a HBR article, Why Citi Got Rid of Assigned Desks, the authors offer a comprehensive summary of the results of this flexible workplace concept, the challenges faced and lessons learned. By consolidating 150 workspaces for 200 people into a single office, Citi saved millions of dollars in overhead costs. In turn, they were able to invest more dollars into making the space functional, eco–friendly and pleasant for employees. Another significant benefit is employee innovation through new social interactions. Read more valuable takeaways from this project here. Staying healthy at work can be quite a challenge, but it doesn’t have to overwhelm. Here are 3 ways to boost your workplace wellness and 4 habits that are negatively effecting it. Coffee is the energy-boosting drink of choice at most offices. Did you know that water also has energizing benefits? Keep a pint of water by your desk at all times and drink frequently. Fatigue is one of the main symptoms of dehydration. Stay hydrated and stay stimulated. Gum can do more than just freshen your breath; it also boosts cognitive performance and increases energy. Researchers suggest that chewing gum enhances performance due to “mastication-induced arousal,” meaning that just the act of chewing wakes us up and keeps us focused. Your creative process can be messy, but your desk doesn’t have to be. Allot 10 minutes every evening to clean up your desk, put away any errant papers, tidy all of your cables, and toss your trash. The next morning you’ll arrive to a more peaceful working environment. Arriving late gets your day off to a hurried, stressful start. Instead, try to arrive 30 minutes early so you can deliberately set your priorities and settle in before the office chaos crescendos. Nothing feels quite as satisfying as checking items off your to-do list. Conversely, nothing feels quite as daunting as seeing that you have a torrent of tasks left to complete. Instead of making a protracted list of to-dos, start your day by identifying your one Most Important Task (MIT). Your MIT should always be specific and achievable. This simple act will give you a sense of purpose as you go about your workday. Your office chair is seriously draining your office energy and creativity. This spring, do yourself a favor and replace your office chair with an upright seat. Doing so will keep your body and mind engaged, boosting productivity and performance. Content found online at Focal, May 19, 2015. With the understanding that not everyone needs such a high performance, highly technical product, Innovant is launching NIGEL, a new product line that features a modern, yet classic design that is still suitably sophisticated and simple to specify. It has a lightweight appearance because of its slim frame and lack of hardware, giving it a residential feel. It certainly does not replace the company’s hit FORm_office line, rather enhances it by giving customers other options. NIGEL works well for customers seeking Innovant’s design methodology – clean, intelligent and tailored products – who do not have the high-level technology management needs. NIGEL hopes to [further] open up Innovant products to a new category of customers… The company has quietly emerged from the New York financial market and has been gaining traction in other sectors… The company continues to branch out from there. Originally published in the Monday Morning Quarterback, June 8, 2015. Innovant has expanded its selection of open plan workstations with the launch of NIGEL Desking. This new product line features a modern, yet classic design that is both sophisticated and simple to specify. Characterized by a lightweight appearance due to its slim frame and lack of hardware, NIGEL evokes a residential feel in the workplace. NIGEL is the perfect solution for clients seeking Innovant’s trademark design methodology – clean, intelligent and tailored products – who do not have high-level technology management needs. With a profile that draws upon the universally admired Parsons Desk frame, NIGEL’s quick assembly, knock-down (KD) design allows for efficient transportation, rapid installation and/or reconfiguration. Available in a variety of colorful finishes, NIGEL allows designers and clients to achieve a signature aesthetic. Collaborative and mobile office workers across different industries - from technology to media, or real estate and design – can also personalize their space with distinctive storage and connectivity features. Whether through unique material selection or adapted storage and privacy accessories, NIGEL can be tailored to suit any client’s needs. “We created NIGEL in response to our specifier partners who wanted a product with Innovant’s sensitivity to design and user-centric features, but on a lighter scale than our other product lines,” explains Bruce Wells, Director of Marketing & Development at Innovant. Consistent with all Innovant products, NIGEL delivers a minimalist aesthetic with intelligent and purposeful features that can be easily tailored to meet the requirements of every project. For more information about Innovant or its products, please visit http://www.innovant.com.